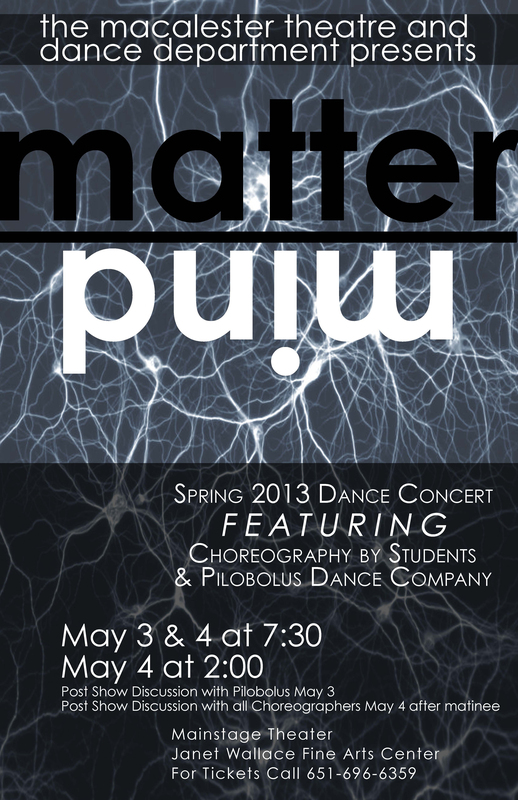 St. Paul, Minn. – The Macalester College Theatre and Dance Department presents Matter Over Mind, the 2013 Spring Dance Concert, with new works choreographed by students and Pilobolus Dance Theatre. Performances are at the Janet Wallace Fine Arts Center, Main Stage Theater, 1600 Grand Ave., St. Paul, at 7:30 p.m. on Fri., May 3, and 2 p.m. and 7:30 p.m. on Sat., May 4. For ticket information, call 651-696-6359. There will be a post-show discussion after the Friday night show with Pilobolus Dance Theatre and another post-show discussion after the Saturday matinee with all student choreographers. Pilobolus Dance Theatre, in residency through the Ordway’s Campus Connections program, presents Red Queen. Pilobolus Dance Theatre, founded in 1971, has continuously pushed the boundaries of how the human body can be used as a means of expression. Founded in the roots of a collaborative process, Pilobolus has worked with the MIT Robotics Lab, OK Go, and Radiolab, among others. The Pilobolus touring company travels all over the world performing world-renowned pieces which have won numerous awards. The Pilobolus Institute works to bring dancers and non-dancers alike through educational outreach programs, workshops, and collaborations such as Red Queen. Red Queen involves 13 Macalester dancers and includes clips shot and produced by University of St. Thomas videography students from Prof. Tim Scully’s class. The dancers and members of Pilobolus, in collaboration with Prof. Chip Small’s Ecology class and Prof. Maria Dahmus’ Environmental Studies class, both from UST, devised the piece. Red Queen was made possible by the Ordway Campus Connections, a program funded by a grant from the Wallace Foundation, which encourages interaction through the arts at Macalester College, the University of St. Thomas, and Metropolitan State University by means of performance, collaboration, and professional residencies. One of the goals of this particular project was to introduce Pilobolus’ distinct aesthetic and artistic process to a variety of students who may or may not usually consider themselves artists and encourage collaboration between the arts and more traditionally academic disciplines. 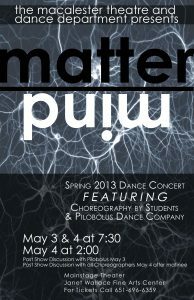 Student choreographed pieces in Matter over Mind include Re(x! )clamation, by Laura Levinson ’13 (Denver, Colo.) that examines the act of reclaiming, sanctifying, utilizing, and relating to space, burning sage to purify the space where the dance takes place. Embellished and Then, choreographed by Phoebe DeVincenzi ’13 (New York, N.Y.) and Emma Buechs ’13 (Glendale, Wis.), explores the stories that we choose to tell with our bodies as they relate to reality and to the imagined, looking at the repetitions and evolutions of preformed identities. See Creatures, choreographed by Kate Keleher ’13 (Winchester, Mass. ), tells the story of one person’s encounter with unearthly beings. 0 1 1 2 3, devised by Emma Buechs and ensemble, explores patterns and cyclical relationships, inhabiting the space of the never-ending. It is Hard to Tell, created and danced by Hannah Geil-Neufeld ‘13 (Chicago, Ill.) and Emma Buechs, examines the means and ways of knowing a person, and celebrates a friendship of great influence. Black Sheep examines the dynamics of a three-person relationship when one feels marginalized by the others. In Bodacious’s piece, Bodacious Over Mind, dancers become zombies except for one dancer, who tries to escape. And Julia Davidson ’13 (Lawrence, Kan.) offers a as-of-yet-untitled trio piece that questions what happens when you try to create a dance using just your sense of proprioception.